Definition at line 40 of file llnamelistctrl.h. Definition at line 45 of file llnamelistctrl.cpp. Definition at line 64 of file llnamelistctrl.cpp. Definition at line 194 of file llnamelistctrl.cpp. References LLScrollListCtrl::addElement(), LLSD::asString(), DB_FIRST_NAME_BUF_SIZE, DB_GROUP_NAME_BUF_SIZE, DB_LAST_NAME_BUF_SIZE, first, gCacheName, LLScrollListCtrl::getColumn(), LLScrollListItem::getColumn(), LLCacheName::getGroupName(), LLCacheName::getName(), LLScrollListItem::getUUID(), LLScrollListColumn::mHeader, mNameColumnIndex, LLColumnHeader::setHasResizableElement(), TRUE, and LLScrollListCtrl::updateMaxContentWidth(). Referenced by LLFloaterNewIM::addAgent(), LLFloaterNewIM::addGroup(), LLFloaterNewIM::addSpecial(), LLPanelGroupInvite::impl::addUsers(), fromXML(), LLPanelGroupGeneral::update(), LLPanelGroupMembersSubTab::updateMembers(), and LLPanelGroupGeneral::updateMembers(). Definition at line 151 of file llnamelistctrl.cpp. References LLScrollListCtrl::addItem(), DB_GROUP_NAME_BUF_SIZE, gCacheName, LLScrollListItem::getColumn(), LLCacheName::getGroupName(), LLScrollListItem::getUUID(), and mNameColumnIndex. Definition at line 141 of file llnamelistctrl.cpp. References LLScrollListCtrl::addStringUUIDItem(), DB_GROUP_NAME_BUF_SIZE, gCacheName, and LLCacheName::getGroupName(). Definition at line 165 of file llnamelistctrl.cpp. References LLScrollListCtrl::addItem(), DB_FIRST_NAME_BUF_SIZE, DB_LAST_NAME_BUF_SIZE, first, gCacheName, LLScrollListCtrl::getColumn(), LLScrollListItem::getColumn(), LLCacheName::getName(), LLScrollListItem::getUUID(), LLScrollListColumn::mHeader, mNameColumnIndex, LLColumnHeader::setHasResizableElement(), and TRUE. Definition at line 71 of file llnamelistctrl.cpp. References LLScrollListCtrl::addStringUUIDItem(), DB_FIRST_NAME_BUF_SIZE, DB_LAST_NAME_BUF_SIZE, first, gCacheName, and LLCacheName::getName(). 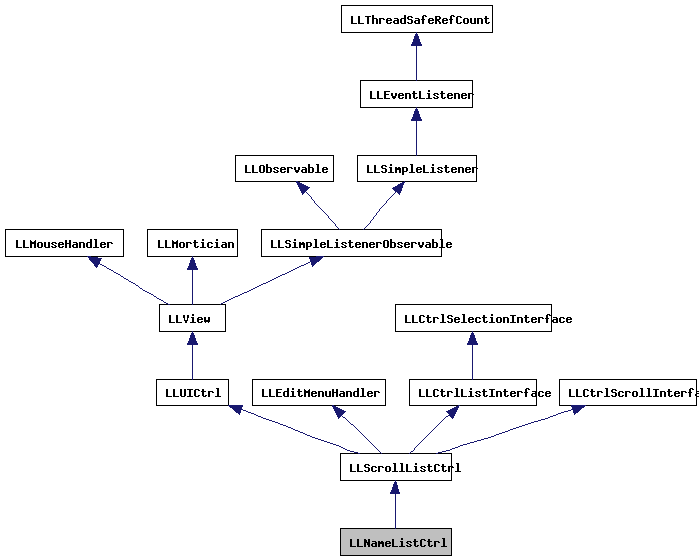 Referenced by LLPanelGroupRolesSubTab::buildMembersList(), LLPanelGroupActionsSubTab::handleActionSelect(), handleDragAndDrop(), LLDispatchSetEstateAccess::operator()(), LLPanelLandBan::refresh(), and LLPanelLandAccess::refresh(). Definition at line 318 of file llnamelistctrl.cpp. References addElement(), LLScrollListCtrl::addSimpleItem(), LLView::createRect(), f, FALSE, LLUICtrl::initFromXML(), LLFontGL::LEFT, LLNameListCtrl(), LLPointer< Type >::notNull(), NULL, S32, LLView::selectFontHAlign(), setAllowCallingCardDrop(), LLScrollListCtrl::setCollapseEmptyColumns(), LLScrollListCtrl::setColumnHeadings(), LLScrollListCtrl::setDisplayHeading(), LLScrollListCtrl::setHeadingHeight(), LLScrollListCtrl::setScrollListParameters(), and TRUE. Definition at line 54 of file llnamelistctrl.h. Definition at line 53 of file llnamelistctrl.h. Definition at line 302 of file llnamelistctrl.cpp. References LLScrollListCtrl::getXML(), mAllowCallingCardDrop, mNameColumnIndex, and TRUE. Definition at line 93 of file llnamelistctrl.cpp. References ACCEPT_NO, ACCEPT_YES_MULTI, addNameItem(), DAD_CALLINGCARD, FALSE, LLInventoryItem::getCreatorUUID(), LLView::getName(), LLView::getToolTip(), lldebugst, llendl, mAllowCallingCardDrop, and TRUE. Definition at line 254 of file llnamelistctrl.cpp. References LLScrollListCtrl::mItemList, mNameColumnIndex, and LLScrollListCtrl::updateMaxContentWidth(). Definition at line 287 of file llnamelistctrl.cpp. Definition at line 240 of file llnamelistctrl.cpp. 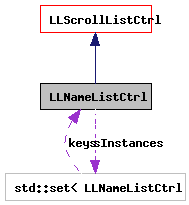 References LLScrollListCtrl::deleteSingleItem(), LLScrollListCtrl::getFirstSelected(), LLScrollListCtrl::getItemIndex(), S32, and LLScrollListCtrl::selectByID(). Definition at line 86 of file llnamelistctrl.h. Definition at line 91 of file llnamelistctrl.h. Referenced by getXML(), handleDragAndDrop(), and setAllowCallingCardDrop(). Definition at line 90 of file llnamelistctrl.h. Referenced by addElement(), addGroupNameItem(), addNameItem(), getXML(), and refresh(). Definition at line 89 of file llnamelistctrl.h. Referenced by LLNameListCtrl(), refreshAll(), and ~LLNameListCtrl().